The 1886 N167 Old Judge Baseball Card set contains 12 cards measuring 1 1/2" x 2 1/2". The N167 Old Judge cards have black and white portraits on the front with the words "Old Judge" in big letters across the top. Below the frame are position, player name and team. 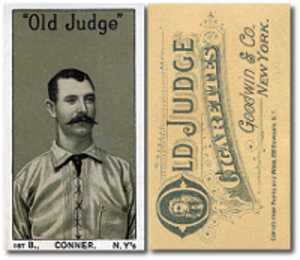 Card backs feature ads for Old Judge Cigarettes. This was the first baseball card set issued by Old Judge, and it features players exclusively on the New York Giants. Hall-of-Famers included in this set are: Roger Connor, Buck Ewing, Tim Keefe, Jim O'Rourke, John Montgomery Ward and Mickey Welch. CLICK HERE if you want to sell your 1886 N167 Old Judge Baseball Cards.